Caelan wrote: There's fudge room built in by an algorithm which allows for some buffering between MOCs, so SSchmidt's "Long-live my nasty Queen" MOCs don't have to sit touching Lord Mercat's "Off with her head!" MOCs. Seriously though, thanks a bunch Gary for the update. I will switch my MOC's over. I am looking at a total force of about 500 Outlaws for the event (although I am seriously wondering if it even be worth it to bring them all, as posing them would take hours!). And these aren't your typical, bare-chested, hairy, illiterate Outlaws (with the exception of the 100 + orcs, goblins, and trolls). These are soldiers of the Queen, new dragon knights, old revised dragon knights, Bat lords and fright knights, etc. They are all armed as well. My original plan for Brickfair VA was to have a massive castle, owned by my Outlaw forces, and being seiged by my other 200+ other faction troops. After seriously considering this, I don't see how this will be possible for me to pull off alone. I realize there needs to be building, but I am wondering how well a massive minifigure battlefield would look? I am still quite convinced I should display my massive minifigure armies on the field of battle. Then again, isn't this frowned upon by some? Louie are you definitely coming? That would be great. This idea would fit for the vignettes. 1. Big, hairy hack & slash battle. SSchmidt versus everyone else His 500+ band of foul, tyrant-supporting Outlaws vs. whatever we can muster up in the way of opposition. Adherents of this: Joshua, SSchmidt, Lord Mercat, and this guy named Caelan. Anyone else? 2. Collective build of a town, with different architecture representing the 4 factions, joined together to symbolically represent Roawia. I believe Zachary is the main proponent here; anyone else? This would take a lot of pre-convention committment and coordination, but it would be very cool. SSchmidt wrote: I am looking at a total force of about 500 Outlaws for the event (although I am seriously wondering if it even be worth it to bring them all, as posing them would take hours! )....I don't see how this will be possible for me to pull off alone....I am wondering how well a massive minifigure battlefield would look? ...Then again, isn't this frowned upon by some? This was a massive Napoleonic battle that Casey Mungle, Magnus Lauglo, Joshua and I, and about 6 other friends set up in one night at BFVA 2011. There are over 1000 figs here, and we did it in one night. And BFVA is now 5 days long...It's NOT looked down upon; that's the Star Wars Cloner kiddies who just line up their 100s of Clones in formation on a plate. We would potentially be doing a battle, with posing and terrain. Actually, this sort of thing is very popular at the show. I also think if we are going to do the battle though, we've got to work out how much space we are going to take up first, and from there we can determine the setting- I am all for the Gates of Stonewald- and about how many figs we would need to have a good battle setup. One we've got the total amount of figs necessary, we can determine who is going to bring how many of what, and if the outlaws need to be on the defensive or offensive. Also, yeah the whole fig battle thing is not looked down at all. I actually had a battlefield setup for my Brickfair VA 2013 display, where I basically used the display as a battlefield for a game of brikwars (think lego wargame). It was pretty fun, and we had a lot of the public who seemed to like it as well. Caelan wrote: 1. Big, hairy hack & slash battle. SSchmidt versus everyone else His 500+ band of foul, tyrant-supporting Outlaws vs. whatever we can muster up in the way of opposition. Adherents of this: Joshua, SSchmidt, Lord Mercat, and this guy named Caelan. Anyone else? I was originally against a giant battle not a collective town/village, but I've gotten over that now. I'm more opposed to the whole clone kiddie thing of lining up hundreds of figs on a 64 baseplate. To each his/her own but I don't find that very interesting. I wouldn't mind a huge battle. Maybe the siege of a keep with big open plains all around? I also wouldn't mind posing a couple hundred figs for battle either. That's one of the best parts of building a battle scene! I'm also planning on bringing at least one vig of something Outlaw related. I think it would be nice for the public to see all the different factions in their own light. I can assume Lenfald is already represented? If Mark and Steven plan on going again I'm sure they'll both bring a Loreos and Garheim build. I will plan at least one Outlaw related build to bring as well. sets I would have about 100 more. I could commit these guys (as much as needed) for the event. Not all my Lenfald's and loreesi are yellows though. Some are fleshies. Sorry I haven't posted in a while, with my great-aunt visiting I forgot to check here periodically. Thank you, "Adviser". You have some good points though. ZacharyIslazy wrote: I was originally against a giant battle not a collective town/village, but I've gotten over that now. I'm more opposed to the whole clone kiddie thing of lining up hundreds of figs on a 64 baseplate. To each his/her own but I don't find that very interesting. I wouldn't mind a huge battle. Maybe the siege of a keep with big open plains all around? I also wouldn't mind posing a couple hundred figs for battle either. That's one of the best parts of building a battle scene! Execllent! I agree, posing the figs is one of the best parts about a huge battle. Lord Mercat wrote: I also think if we are going to do the battle though, we've got to work out how much space we are going to take up first, and from there we can determine the setting- I am all for the Gates of Stonewald- and about how many figs we would need to have a good battle setup. One we've got the total amount of figs necessary, we can determine who is going to bring how many of what, and if the outlaws need to be on the defensive or offensive. Also, yeah the whole fig battle thing is not looked down at all. I actually had a battlefield setup for my Brickfair VA 2013 display, where I basically used the display as a battlefield for a game of brikwars (think lego wargame). I remember that now! I complimented your awesome rancors. They'd be a great addition to our display! Everyone has some great ideas, and I'd love to do them all, but sadly we don't have enough lego for that. Since the majority are for it, I think a gigantic battle is what we'll do. All in favor of this course of action (pun intended ), PM me. The next thing then is, what kind of battle shall we do? A siege on the King's-now-Queen's castle? A huge field battle? Or perhaps the re-taking of a major city, like Lord Mercat is in favor of? I'd love to hear what you all think on this. Also, does anyone know if Mark, Steven, and Stuartt are coming? Because if so, I'll need to update the list of collab members that I have. Again, please let me know what you think. I value all your opinions highly. Sir Haymar wrote: The next thing then is, what kind of battle shall we do? A siege on the King's-now-Queen's castle? A huge field battle? Or perhaps the re-taking of a major city, like Lord Mercat is in favor of? I'd love to hear what you all think on this. Also, does anyone know if Mark, Steven, and Stuartt are coming? Because if so, I'll need to update the list of collab members that I have. Again, please let me know what you think. I value all your opinions highly. I think the siege of an Outlaw keep/castle would work best. My reasoning is that the 3 factions don't really hold any unified positions. And every time they've combined forces they've always been the attackers. 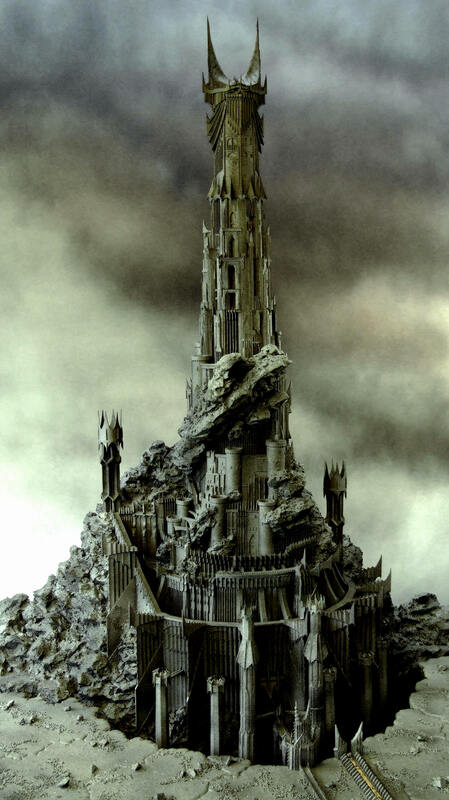 So I think we should have some kind of central castle, maybe a big obsidian castle similar to Barad-dûr like we discussed earlier in the thread. This can be surrounded by rolling fields and swamps. I also think a good scenario for what the battle could look like would be an organized Outlaw force in the keep, with the three factions in formation around the castle. A unified force can be storming the gates, but towards the edges of the build we can have the unorganized Outlaw forces, Orcs, Outlaw bands and drifters, trolls, goblins, etc. coming to the aid of the besieged keep. I'm not sure if Mark and Steven are coming, and I think Stuartt is in a dark age. Stuartt told me he might show up but without builds a couple months back, but I'm not sure if that's the case anymore. Okay, these are my arguments for the retaking of a major city- Considering how many LCCers we have coming to this convention I think that we have a very rare opportunity to make a build that actually has a very large impact on the LCC storyline. While attacking an outlaw outpost would be really cool, I feel it doesn't have much of a story or role playing impact, especially as, at the time of BF VA, we seem to be heading right into the thick of the Roawian-wide rebellion! This is a very rare opportunity to show a major battle at the gates of an important Roawian city- we can become a part of a major event in Roawian history! On another note, technically one could argue that all major cities are outlaw outposts so long as the queen rules. I suggested Stonewald because of the various capitols of the regions, Lenfald is right in the middle, and Stonewald is in the heart of Lenfald- meaning that distance wise (From a Roawian perspective) it would be less of a travel for everyone, and thus would make more sense that a contingent of all three regions might feasibly be there.- for example if we did Balmunatha, than it would be tough to have some Garhims all the way down in Loreos, or if it were an Outlaw outpost in the swamps, its even more of a travel. Or vice versa with a location up in Garheim. Also, I don't see any reason we can't have a large area to stage a lot of the fight on in front of the gates. Now, I also think that retaking the Queen's castle would be really cool, but I get the feeling we would probably need permission from the KC to do that before we all commit to it. If we did this however, it might be interesting to make the castle as warped by black magic, sort of like a twisted evil fortress more suitable for the Queen, courtesy of Maldrake's powers. I may have more by the time of the fair, but fig wise that's about what I can commit to at this point in time. Lord Mercat wrote: Okay, these are my arguments for the retaking of a major city- Considering how many LCCers we have coming to this convention I think that we have a very rare opportunity to make a build that actually has a very large impact on the LCC storyline...I suggested Stonewald ...Now, I also think that retaking the Queen's castle would be really cool, but I get the feeling we would probably need permission from the KC to do that before we all commit to it. A city would take some serious building coordination, and more importantly, time, which I do not have. We do have quite a few coming, but many of us are already committed to other collaborations. I for one will have to man the Civil War and Pharaoh's Labyrinth collabs the entire time the public is there Saturday and Sunday. And with the other MOCs I must build, I'll do what I can for LCC, but a city I can't do much for. My Black Swan Tavern is about it, and it's still a WIP at this point. Due to purchasing of more Civil War; and British soldiers and Zulu minifigs, this LCC army will not grow by much before BFVA. Anyway, that's my 2 cents. I was thinking more along the lines of portraying the gates/ front wall of the city, versus the whole entire city (no real need for an interior), I don't think I made that clear. It wouldn't really be too much different from building a tower with a curtain wall. Versus a random outlaw tower with regular outlaws, I think it would have more of an impact to battle the queen's forces, especially in a major location. That said, I'm sure whatever we end up doing will be awesome. Also, on a different note, I can probably also chip in a few evil wizards and such if needed. Lord Mercat wrote: Okay, these are my arguments for the retaking of a major city- Considering how many LCCers we have coming to this convention I think that we have a very rare opportunity to make a build that actually has a very large impact on the LCC storyline. While attacking an outlaw outpost would be really cool, I feel it doesn't have much of a story or role playing impact, especially as, at the time of BF VA, we seem to be heading right into the thick of the Roawian-wide rebellion! This is a very rare opportunity to show a major battle at the gates of an important Roawian city- we can become a part of a major event in Roawian history! On another note, technically one could argue that all major cities are outlaw outposts so long as the queen rules. Although this a nice plan I see a few problems with it. First, although Stonewald is in the heart of Roawia, it's also in the heart of Lenfald. Like you said, this could be a key point for staging a rebellion, but the problem is that with it being in the heart of Lenfald it'll be much harder for Loressi and Garhims to travel there. With the Queen's rule in full effect it has become harder than ever for citizens to travel in between nations. Then there is how we decide to depict the city. If we do just the gates, it could work, but then I feel as if we only portrayed a small portion of the battle (Just at the gates). If we had a full tower like Gary and I are wanting, it'd be smaller, but it'd also give a full perspective of the battle. The other problem I see with this plan is that it would involve using many of the new castle figs for the Queen's troops, and I'm not sure how many everybody has. I only have 5. Still, if we do end up going with this plan I could talk with the KC and discuss what we plan, and if we can incorporate it into the story line. The other plan of attacking the Queen's castle could work too, but again I'd have to talk with Jordan and the other Council members about how to implement it into the story line. As for troops I can chip in, it's not much. ZacharyIslazy wrote: Although this a nice plan I see a few problems with it. First, although Stonewald is in the heart of Roawia, it's also in the heart of Lenfald. Like you said, this could be a key point for staging a rebellion, but the problem is that with it being in the heart of Lenfald it'll be much harder for Loressi and Garhims to travel there. With the Queen's rule in full effect it has become harder than ever for citizens to travel in between nations. Then there is how we decide to depict the city. If we do just the gates, it could work, but then I feel as if we only portrayed a small portion of the battle (Just at the gates). If we had a full tower like Gary and I are wanting, it'd be smaller, but it'd also give a full perspective of the battle. The other problem I see with this plan is that it would involve using many of the new castle figs for the Queen's troops, and I'm not sure how many everybody has. I only have 5. Still, if we do end up going with this plan I could talk with the KC and discuss what we plan, and if we can incorporate it into the story line. I can see your points. Personally, I think even if we were only depicting a small portion of a larger battle, it would simply work to our favor and give a really great sense of a huge scale assault. Traveling between nations would be difficult, but if it were set in Lenfald, the maximum amount of borders one would have to cross is merely one border, due to its location. Secret movement to mobilize an assault would be difficult no matter where the battle occurs, but it would be easier than most other places were it in Lenfald. As for the Queen's soldiers, I figured Schmidt would have had that covered, as I think his forces are queen's supporters. I didn't mention it earlier because Schmidt seems to have the outlaws covered, but if this is a problem, I do have approximately 60 queen's soldiers lying around that we could intersperse with non-specific queen outlaws to tie all of the outlaws together as an army under the queen. I don't think you need the specific torsos to pull this off, you just need a few of them placed correctly, and some nice banners/shields. That said you just gave me (what I think) is a marvelous idea for this collaboration. Maldrake the Silent. He seems to be the key adviser for the Queen and a cornerstone of her new empire. Now, with the permission of the KC- What if we made an all out assault on Maldrake's fortress? While I'm certain he spends a lot of his time with the Queen, he is bound to have his own evil fortress located somewhere. If an enterprising group of allied Roawian forces banded together and were able to capture his fortress, and Maldrake along with it,, that would be a major blow to the Queen- even if they failed, it would still be a major storyline event. This way we can both do something that really impacts Roawia, AND do the giant evil fortress that you guys wanted to do! What do you think? This is a great idea. Although I will most likely not participate, I could send some custom Dragon Knight banners and capes to enhance the battlefield. Also, I believe that Maldrake does have a fortress somewhere on the Magical Isles. I plan on sending someone with some freebie capes to give out to attendees, so I could send some stuff for the colab. too. How many give-away capes should I make? Hmmnn...This could definitely work! I'll have to talk with the KC about the plot line for Maldrake, but if this is something a majority of people could work with and want to do, I'm sure the KC could write this into his story. Maldrake the Silent goes out with an impressive *BANG*. Lord Mercat wrote: That said you just gave me (what I think) is a marvelous idea for this collaboration. Maldrake the Silent. He seems to be the key adviser for the Queen and a cornerstone of her new empire. Now, with the permission of the KC- What if we made an all out assault on Maldrake's fortress? While I'm certain he spends a lot of his time with the Queen, he is bound to have his own evil fortress located somewhere. If an enterprising group of allied Roawian forces banded together and were able to capture his fortress, and Maldrake along with it,, that would be a major blow to the Queen- even if they failed, it would still be a major storyline event. This way we can both do something that really impacts Roawia, AND do the giant evil fortress that you guys wanted to do! What do you think? I love it!! That is a fantastic idea, and I think that's what we should do. So, all in favor of Lord Mercat's idea, please PM me. One thing, who's going to contact the KC?